Editor’s Note: The sixth paragraph of this story has been recast to clarify Gregory Yount's role in the lawsuit and his concerns about consideration of Native American religions in this case. PHOENIX – The U.S. Interior Department’s decision to withdraw 1 million acres around the Grand Canyon from new uranium-mining claims for 20 years will protect cultural resources, water and the environment, an attorney representing the Havasupai Tribe and environmental groups said Tuesday. “This has been about protecting a variety of cultural assets,” said Alison Flint, the associate attorney for Earthjustice, a nonprofit environmental firm representing the interests of the tribe as well as groups including the Grand Canyon Trust, Sierra Club and Center for Biological Diversity. A coalition of mining industry groups and the Arizona/Utah Local Economic Coalition challenged the withdrawal in U.S. District Court. Both sides argued Tuesday before Judge David C. Campbell, who said he would rule in the next two weeks. Flint said the disturbances to the tribe, whose ancestral land includes areas removed from mining, went beyond religious dissatisfaction, citing cultural disruption ranging from damage to water tables to dust from trucks. Lawyers for the mining groups argued that the watershed on the parcel north of the Grand Canyon couldn’t possibly affect the canyon, based on geographic studies of the divide. Gregory Yount, a uranium prospector whose lawsuit naming former Secretary of the Interior Ken Salazar and the U.S. Bureau of Land Management is the lead case in a consolidated suit, noted that the area withdrawn from mining is larger than Rhode Island. He said that taken to its extreme the notion of barring uses of public lands seen to be incompatible with Native American religions could apply piecemeal to all federal land and be an endorsement of Native American religion. “No other religion has this status,” Yount told the judge. Uranium mining has been part of northern Arizona’s economy for decades, though it depends heavily on the market. A number of new mines opened in the land surrounding the Grand Canyon in the 1980s, but their use was discontinued. The “zombie” mines became an issue again in 2007, when the uranium market began to boom once more. 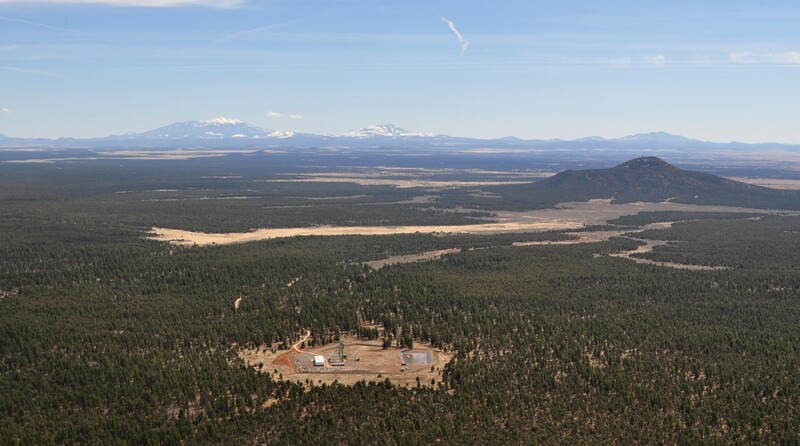 Multiple mines reopened in northern Arizona at the end of the decade, capped by the Bureau of Land Management determining that the Arizona 1 mine could be reopened. In 2012, Salazar imposed a 20-year ban on new uranium mines around the Grand Canyon. Valid mining claims from before that ban were allowed to continue operating. The decision has been the subject of several lawsuits from a variety of mining interests. A March 2013 attempt to overturn the law in U.S. District Court fell short, though an attempt to reopen an existing uranium mine was upheld in the U.S. Court of Appeals. 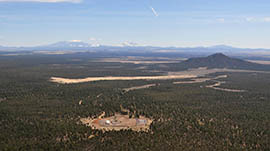 The Canyon Mine in the Kaibab National Forest south of the Grand Canyon, opened in the 1980s, is shown from the air.